HDMI Cable. Amazon Series: Kindle Fire HD (3rd Generation). HDMI male to HDMI Micro Type D male. Connector: HDMI Male to HDMI Micro Type D Male. 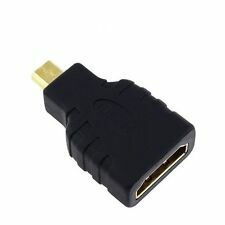 1 x HDMI Male to HDMI Micro Type D Male Cable. Motorola Series: DROID 4, DROID RAZR HD, DROID RAZR M, DROID RAZR MAXX, DROID RAZR MAXX HD, DROID X, DROID X2, MB860 Atrix 4G, MB865 Atrix 2 4G, MB886 Atrix HD, XT800 Titanium ilx. 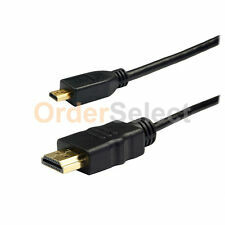 Gold Plated High Speed Female HDMI (Type A) to Male Micro HDMI (Type D) Adapter. Connects portable Micro HDMI devices to Standard HDMI. Converts HDMI Cables to HDMI Micro Connection. m m ( 143. ). HDMI Cable. HDMI male to HDMI Micro Type D male. Connector: HDMI Male to HDMI Micro Type D Male. 1 x HDMI Male to HDMI Micro Type D Male Cable. Any device that uses a micro HDMI port. Quantity: 1. Length: 3 feet. 2 6FT HDMI to Micro HDMI Cable for Smartphone Tablet Amazon Kindle Fire HD HOT! 2 x HDMI Cable. Amazon Series: Kindle Fire HD (3rd Generation). HDMI male to HDMI Micro Type D male. Connector: HDMI Male to HDMI Micro Type D Male. 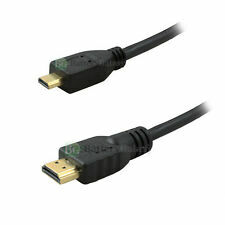 2 x HDMI Male to HDMI Micro Type D Male Cable. Motorola Series: DROID 4, DROID RAZR HD, DROID RAZR M, DROID RAZR MAXX, DROID RAZR MAXX HD, DROID X, DROID X2, MB860 Atrix 4G, MB865 Atrix 2 4G, MB886 Atrix HD, XT800 Titanium ilx. 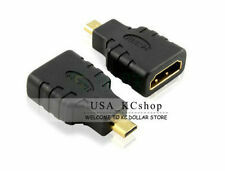 Gold Plated High Speed Female HDMI (Type A) to Male Micro HDMI (Type D) Adapter. Connects portable Micro HDMI devices to Standard HDMI. Converts HDMI Cables to HDMI Micro Connection. Supports 480i, 480p, 720p, 1080i, 1080p,1440P resolution. Amazon Kindle Fire HD B0085P4OWM Tablet. Supports the following resolutions: 720i, 720p, 1080i, 1080p, 1280x1024, and beyond. It has a micro HDMI (type D) connector on one end and an HDMI connector (type A) on the other end. Amazon Kindle Fire HD B0085P40WM Tablet. Supports the following resolutions: 720i, 720p, 1080i, 1080p, 1280x1024, and beyond. It has a micro HDMI (type D) connector on one end and an HDMI connector (type A) on the other end. Will not work on Amazon Kindle Fire, Just Kindle Fire HD! Allowing you to watch all your favourites on BIG SCREEN. 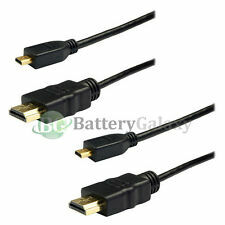 Premium quality Type A to D Micro HDMI Male Cable. 1 x 1.8M Micro HDMi cable. A must have accessory for those who would like to connect Tablet devices to the big screen. Any device that uses a micro USB port and micro HDMI port, including Amazon Kindle Fire HD (3rd Generation Only). PREMIUM HDMI MICRO CABLE. Connectors: HDMI Male to HDMI Micro Type D Male. This shielded, 1.3 certified cable is perfect for connecting your HD devices with an HDMI Micro Type D port. Supports HDMI Micro 1.4 (Type D) input and Standard HDMI 1.4 (Type A) output. Display full HD video on HDTVs, monitors, and projectors from any HDMI Micro enabled device. Combines audio and video into a single HDMI output. Type: Micro HDMI to HDMI Cable. Standard Version: HDMI 1.4. HDMI Ethernet Channel (HEC): Supported. 3D Over HDMI: Supported. Amazon Kindle Fire HD 8.9 B008GW0JC8. It has a micro HDMI (type D) connector on one end and an HDMI connector (type A) on the other end. Connecter Size: Micro HDMI to HDMI. Many smart phones ONLY have a Micro USB Port, and not a Micro HDMI port. Amazon Kindle Fire HD B0085P4OWM Tablet. Type: Micro HDMI to HDMI Cable. Micro HDMI A/V TV Video Cable Cord for. Standard Version: HDMI 1.4. HDMI Ethernet Channel (HEC): Supported. 3D Over HDMI: Supported. Length：5ft. Black HDMI to Micro HDMI Cable. Fully compatible with HDMI 1.4 specification. Item is perfect! Interested in a 2nd for back-up drawer. c 5 ( 27. Small size leaves room for other connections. ). Cable Length: 6ft. Amazon Kindle Fire HD 7" Tablet. Note: Many Smartphones ONLY have a Micro USB Port, and does not have a Micro HDMI port. Both ports looks very similar to each other. Connector size: Micro HDMI Male to Male HDMI. Connector: HDMI male to HDMI Micro Type D Male. HDMI Cable. BUY 2 GET 1 FREE, BUY 3 GET 2 FREE, BUY 4 GET 3 FREE and so on. You don't have to do anything, we will just add them to your order automatically. High Speed HDMI Cable with Ethernet, Type D Micro M/M CableConnect your portable DVs, Cameras, Game Consoles to your HDTV with a true HD connectionA premium quality HDMI - HDMI micro cable suitable for use with camcordersConnectors feature strain relief and Mylar foil shieldingCable constructed using the high quality material for best contact connection between HDMI equipmentsFully HDCP compliant to provide highest level of signal qualityFully compatible with High Speed HDMI with Ethernet specification (Version 1.4)A superb cable with excellent audio-visual transfer properties that deliver signal without compromising purity and balanceFeatures:Connectors ensure highest signal transfer rate and resistance in corrosionLarge gauge PVC jacket provides maximum shielding against wear and tear an.